Chinese New Year celebration will be incomplete (in my opinion...) if Yee Sang is not served within the 15 days of welcoming the Lunar calender.. This dish symbolises Prosperity, Good Luck ,Great Health and all thing auspicious...Some say it reflects our life journey that is fill with bitter, sad, sweet, happy memories...added a with a bit of 'crunch' of excitement and a little bit of 'spice' to make us wiser. I have never had Yee Sang... let alone heard of this dish, until the late 80's when I started to work in Kuala Lumpur. Everyone wants to eat their way to good luck and prosperity ... I can tell you ... the only party that is happy, every time his cash till went... 'kerching...kerching...' is the restaurant owner... Oh yes!!! Yee Sang came with a price tag... almost cut throat!!! Deep fry the wonton skins and leave it to cool. Keep it in air tight container. Thinly sliced ginger and submerged in vinegar mix with 1 tablespoon of sugar. Set aside. Alternative- get the store bought pickled ginger. Dry roast both sesame seeds. set aside to cool and keep in airtight container. Cut the carrot, daikon and cucumber into ribbon strips then cut into long strips. Arrange vegetables, pink grapefruit segments and raw salmon in big salad bowl all . Add in pickled ginger, deep fried wonton crunch then sprinkled sesame seeds. Add a pinch or two 5 spice powder. Lastly drizzle some thick plum sauce. Get everyone to toss for good luck...and enjoy. Looking at your beautiful Yee Sang, I should tell myself too that I should make this next year! And I like how you do the black/white sesame seeds in "Yin & Yang". Beautiful. Hi Lisa! 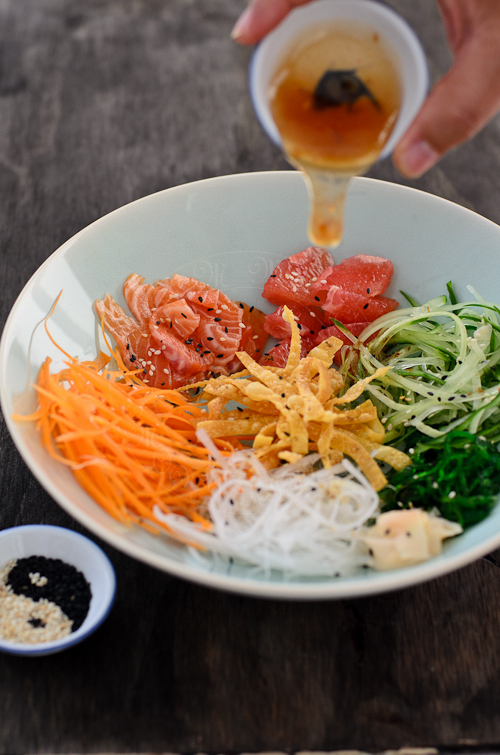 Love your version of YuSheng... Fresh and yummy! ... Like Mel, I love the "Taiji" design of the sesame seeds... I have to commend and salute you for the effort! Great job with the homemade yee sang. It's simple but looks delicious. The one thing I always look forward to during CNY! Black and white sesame seeds look so different here! I mean the Tai Chi symbol : ). I've seen many post about Yee Sang but your recipe and description was the easiest visual and recipe! Now I see what is really in this salad! As always great shot! Oh, you're torturing me! This salad looks so good! The salmon has such beautiful color! Wow, this looks so fresh and delicious! What a great way to curb a raw fish craving!